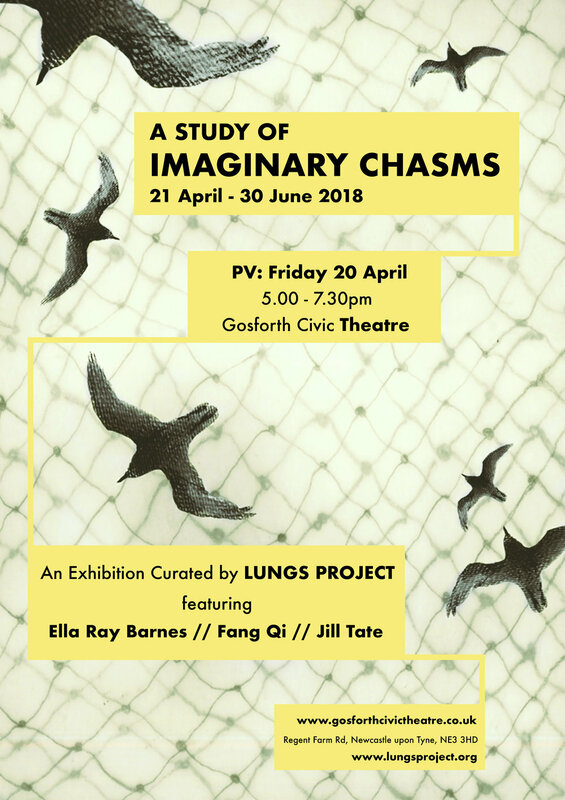 "A Study of Imaginary Chasms"
Lungs Project is pleased to announce a cross-disciplinary group exhibition developed in collaboration with Gosforth Civic Theatre. 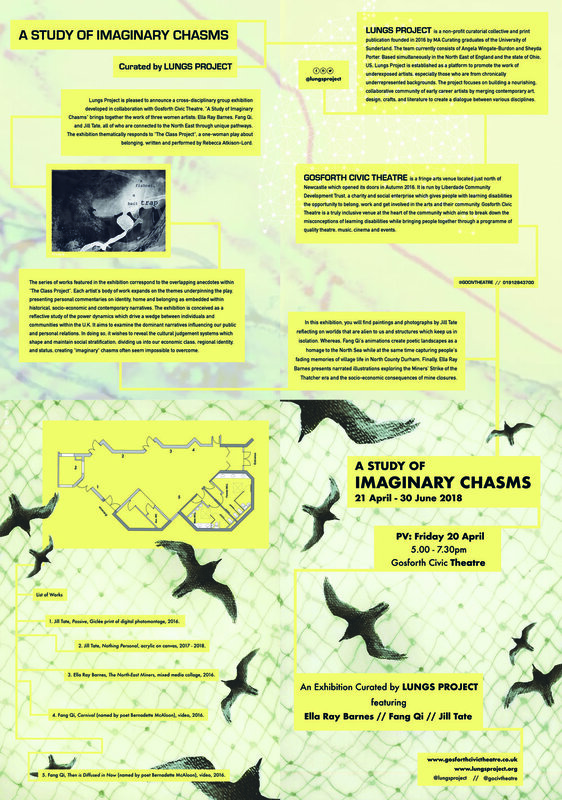 "A Study of Imaginary Chasms" brings together the work of three women artists; Ella Ray Barnes, Fang Qi, and Jill Tate, all of who are connected to the North East through unique pathways. The exhibition thematically responds to "The Class Project", a one-woman play written and performed by Rebecca Atkinson-Lord. The series of works featured in the exhibition correspond to the overlapping anecdotes within "The Class Project". Each artist's body of work expands on the themes underpinning the play, presenting personal commentaries on identity, home and belonging as embedded within historical, socio-economic and contemporary narratives. The exhibition is conceived as a reflective study of the power dynamics which drive a wedge between individuals and communities within the U.K. It aims to examine the dominant narratives influencing our public and personal relations. In doing so, it wishes to reveal the cultural judgement systems which shape and maintain social stratification, dividing us into our economic class, regional identity, and status, creating "imaginary" chasms often seem impossible to overcome. 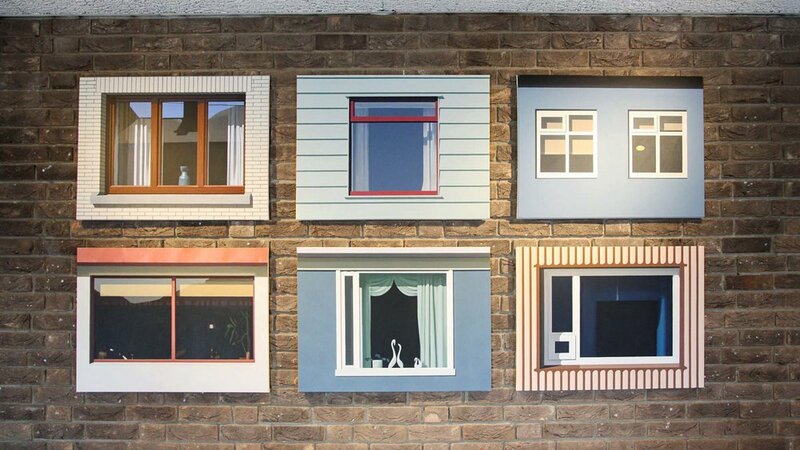 In the exhibition, you will find paintings and photographs by Jill Tate reflecting on worlds that are alien to us and structures which keep us in isolation. Whereas, Fang Qi's animations create poetic landscapes as a homage to the North Sea while at the same time capturing people's fading memories of village life in North County Durham. 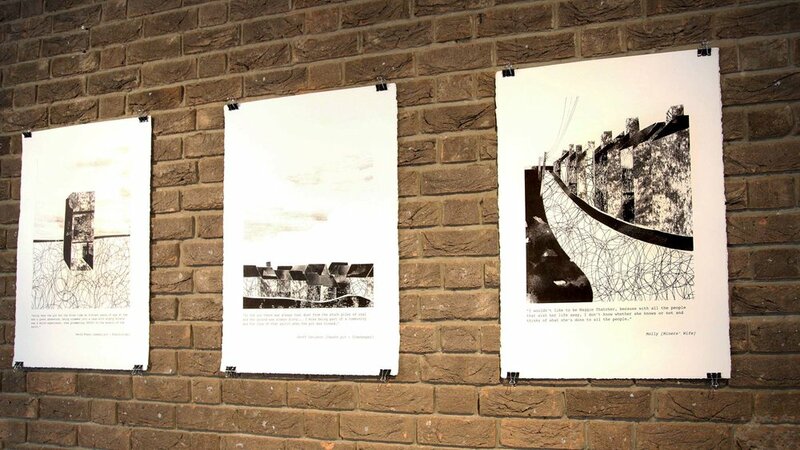 Finally, Ella Ray Barnes presents narrated illustrations exploring the Miners' Strike of the Thatcher era and the socio-economic consequences of mine closures. Gosforth Civic Theatre is a fringe arts venue located just north of Newcastle which opened its doors in Autumn 2016. It is run by Liberdade Community Development Trust, a charity and social enterprise which gives people with learning disabilities the opportunity to belong, work and get involved in the arts and their community. Gosforth Civic Theatre is a truly inclusive venue at the heart of the community which aims to break down the misconceptions of learning disabilities while bringing people together through a programme of quality theatre, music, cinema and events. Ella Ray Barnes, The North-East Miners, digital illustration, 2016. Ella Ray Barnes, The North-East Miners: David, digital illustration, 2016. Fang Qi, Then is Diffused in Now, video animation, 2016. Fang Qi, Then is Diffused in Now, Episode 1, video animation, 2016. Fang Qi, Carnival, video projection and origami sculptures, 2016. Charcoal drawings by Fang Qi.